As we enter Toms River, NJ’s Grunin Center lobby this Sat. Sept. 16, 2017 evening, we see lots of 1960’s-era music lovers of all ages waiting for the auditorium doors to open for tonight’s performance of The British Invasion Years. 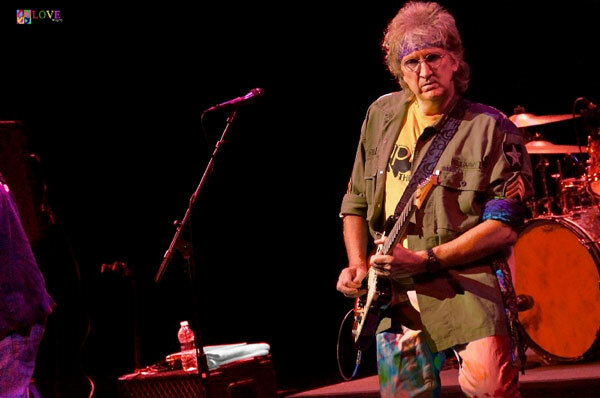 Before that happens, however, we’re told we can sneak behind those double doors for an interview with British Invasion Years band founder, Lee Scott Howard, who warmly greets us and invites us backstage to chat. 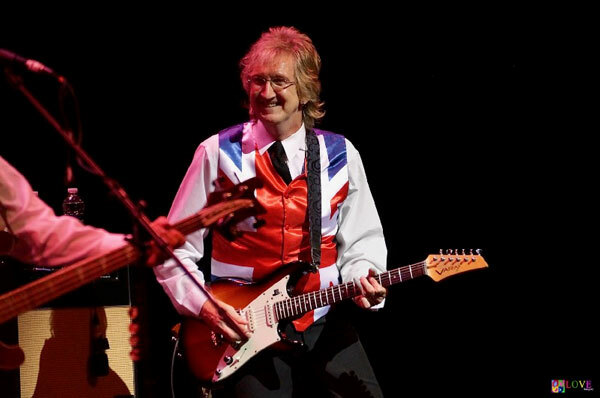 According to Howard — a guitarist and vocalist who looks a little like John Lennon and sounds a lot like Paul McCartney — he and his partner, bassist and vocalist Bobby M., created the British Invasion Years show eleven years ago. 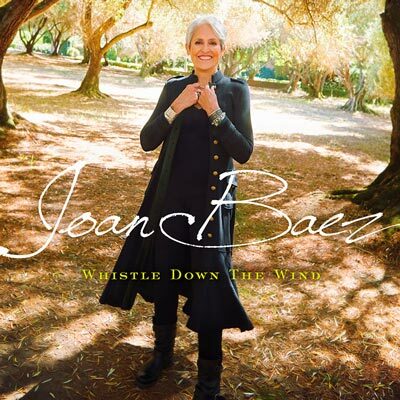 Ardent Beatles fans, the duo wanted to create a show that would pay homage to the Fab Four, but which would also focus on music representing the entire era of the sixties. 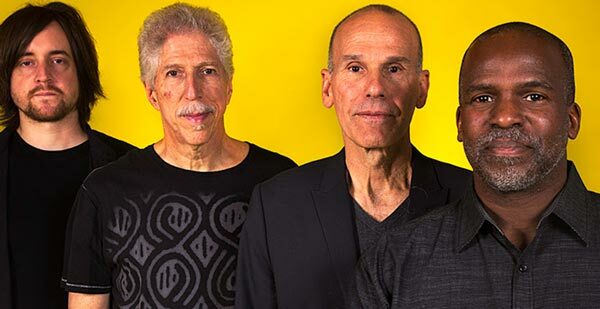 In order to create their production — a show which consists of a rapid-fire delivery of songs played to ’60’s-era photos projected on a screen behind them — Howard reveals that he and Bobby spent a lot of time conducting research on the music of the 1960s. 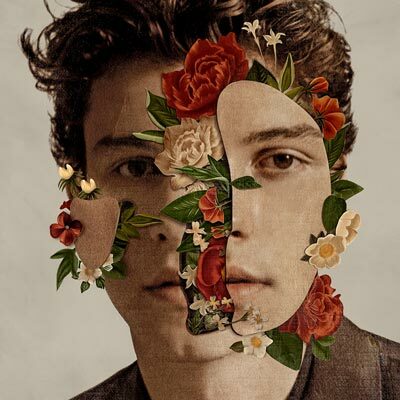 Their goal was not only to determine where potential numbers for the show ranked on the music charts at the time in order to assess their overall popularity, but to appraise their cultural and historical significance as well. 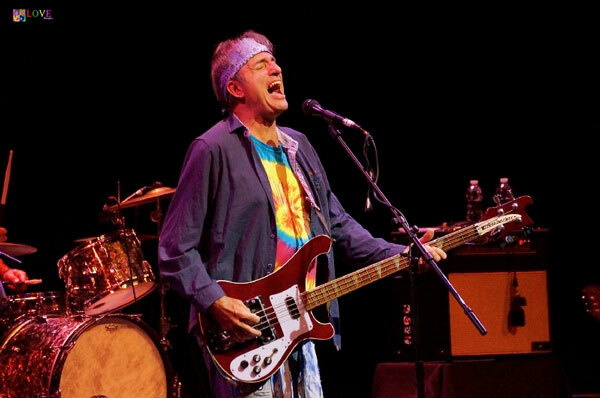 Aside from Beatles’ tunes, when asked about his favorite songs to play in a typical British Invasion Years show, Howard responds, “I love them all,” but admits that he especially enjoys performing “Tuesday Afternoon” by The British band, The Moody Blues, and “Get Together” by the American group, The Youngbloods. 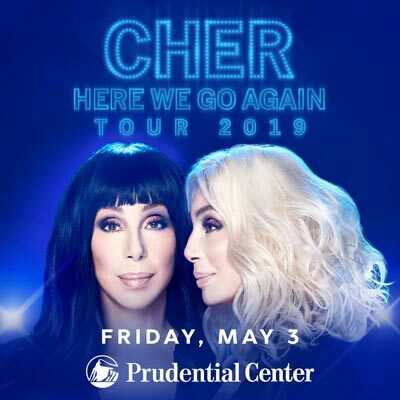 According to Howard, although all of the members of the band are based here in the Garden State, currently, the group performs shows all over the country with appearances in places including Massachusetts, Florida, Wisconsin, and Oregon. 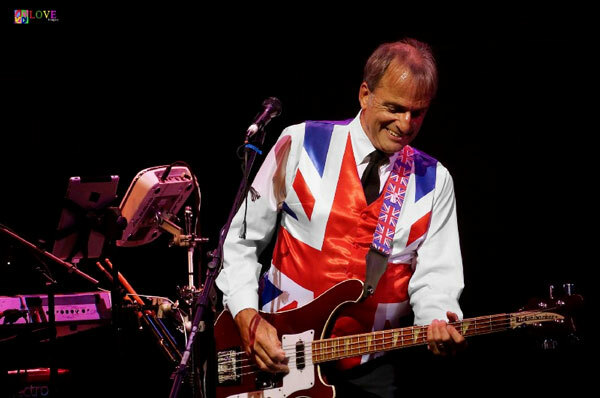 Next, we chat with Bobby M., co-creator of The British Invasion Years, who also sings lead vocals and plays bass with the group. Following our chat with Lee and Bobby, we make our back way to the cozy Grunin Center auditorium to take our seats. 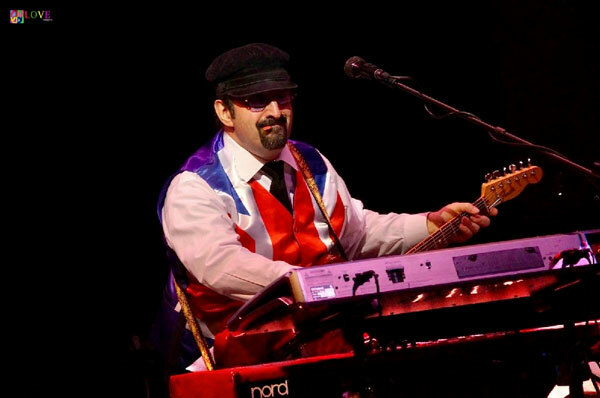 The lights dim and The British Invasion Years cast members — guitarist Lee Scott Howard, bassist Bobby M., keyboardist/guitarist Jon Wolf, and drummer Pete Perrina — take their places on the stage wearing colorful Union Jack vests. As audio of radio static plays, on the screen above the band we see scenes of London — double decker buses, Bobbies with tilted hats — in addition to photos of celebrities of the ’60s including Herman’s Hermits’ Peter Noone, Twiggy, and the The Beatles’ first performance on TV’s The Ed Sullivan Show. 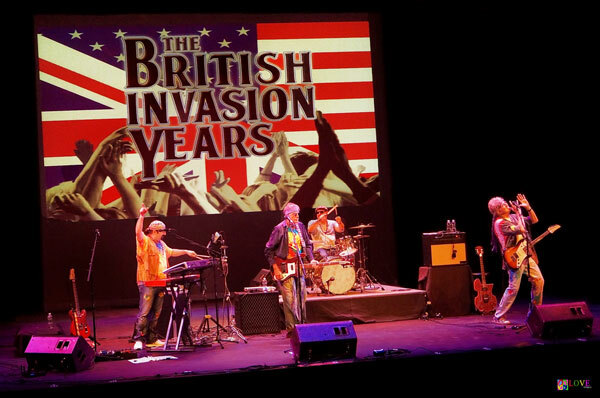 Opening with a trio of Beatles’ classics — “A Hard Days Night,” “Can’t Buy Me Love,” and “Please Please Me” — The British Invasion Years band rocks the Grunin Center house with its energetic sound. 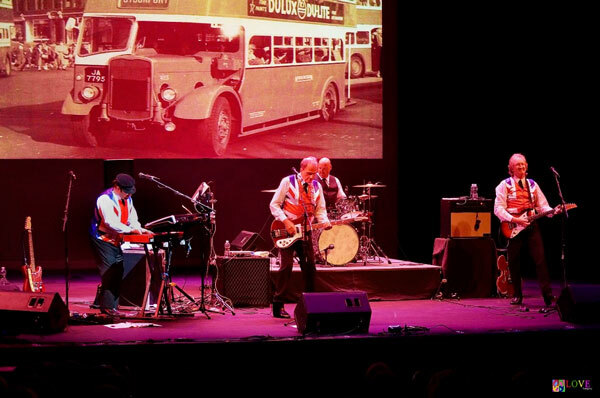 The driving beat of these classic Beatles’ songs warms the audience’s hearts as photos from England morph to the music before the famous faces of the Fab Four smile down in approval of this tribute to them. Along with The Beatles, The Rolling Stones are another well-represented British group in The British Invasion Years’ set list with numbers including “Satisfaction,” and “19th Nervous Breakdown” on tap, not to mention a stellar rendition of “Jumping Jack Flash,” the tunes’ famous guitar lick bringing the audience back in time a half century. Spencer Davis Group’s “Gimme Some Lovin’” features Jon Wolf on keyboards, the tune’s iconic organ riff leading into the number’s catchy vocal. 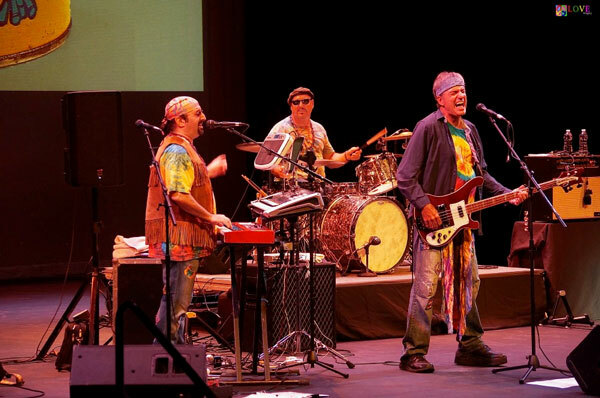 Following songs like The Kinks’ “You Really Got Me” and “All Day and All of the Night,” Act I ends with an exciting version of The Beatles’ “Back in the USSR,” complete with airplane sound effects. 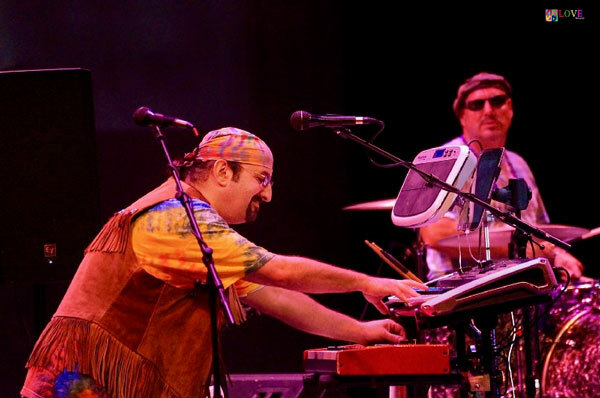 As Act II commences, TBIY band members return to the stage wearing such iconic 60’s garb as tie-dyed clothing, bandanas, an army jacket with an American flag on the back, granny sunglasses, a suede-fringed vest and, of course, blue jeans with colorful patches. On the big screen, we’re treated to images of The Monkees’ Davy Jones with The Brady Bunch’s Marcia Brady, astronaut Neil Armstrong on the moon, a beach party with Frankie Avalon and Annette Funicello, and singer Tiny Tim’s wedding on The Tonight Show with Toms River’s own Miss Vicki, not to mention Twister games, Wishkins troll toys, and Sea Monkeys (“for instant pet, just add water”). The audience snaps their fingers like school kids to the bubblegum sounds of The Archies’ “Sugar, Sugar,” as Archie, Jughead, Reggie, Veronica, and Betty “play” on the screen overhead. 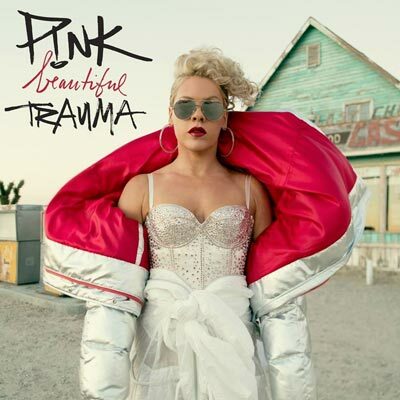 From bubble gum to pop to hard rock, the audience relates to this music. Swinging and swaying, the audience loves The British Invasion Years’ rendition of Neil Diamond’s “Sweet Caroline,” adding the circa-Y2K era “so good, so good, so good” lyrics to the tune! Following a standing ovation — the audience cheering and clapping for more “feel-good” music — The British Invasion Years cast charms the crowd with their rendition of The Beatles’ “Hey Jude.” On this number, the Grunin Center auditorium becomes a sea of swaying cell phone flashlights, everyone happily singing along on the famous “Na, na-na, na-na-na-na” coda. Following the show, we chat with several audience members who share their reactions to tonight’s performance of The British Invasion Years. Lastly, we chat with Paige from Toms River who — as we come to learn — is lead singer Lee Scott Howards’ big sister. 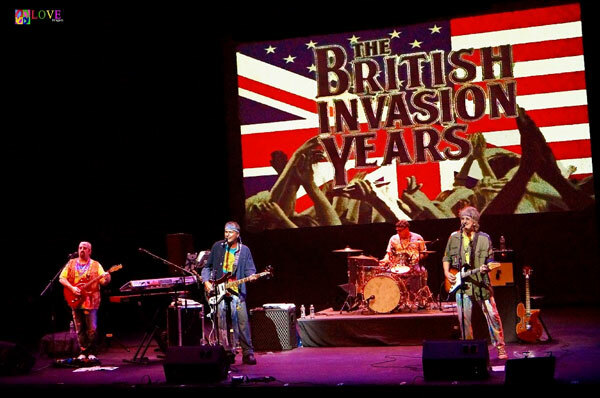 To learn more about The British Invasion Years, please go to britishinvasionyears.com. 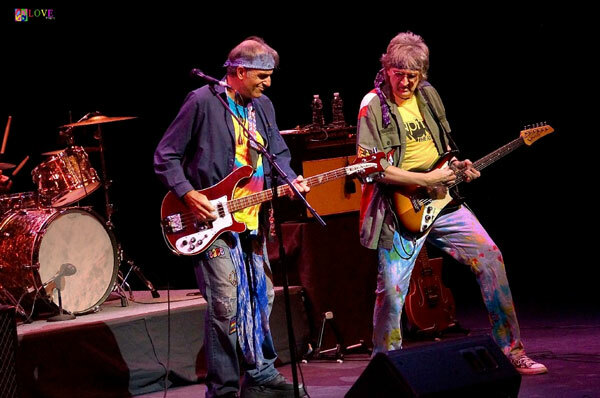 For further information on upcoming performances at Toms River, NJ’s Grunin Center of the Arts — including Rock Star: Supernova and Pink Martini’s Storm Large on October 1, Joan Osborne Sings the Songs of Bob Dylan on October 14, and Herman’s Hermits starring Peter Noone on November 25 — please go to grunincenter.org.